Each year several hundred thousand candidates worldwide sit the Cambridge English: KEY, PET, FCE, CAE and CPE exams. This main suite of exams are recognised by universities and employers around the world as evidence of competence in English. 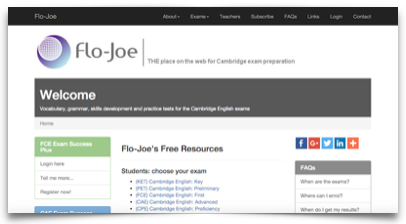 The Flo-Joe website was set up by Fiona Joseph and Peter Travis in 2000 and has been a major source of information and learning support for both teachers and candidates preparing for these exams. During busy periods the website attracts nearly 300,000 users a month who generate almost 500,000 sessions and 2,500,000 page views. In 2003 the website was honoured with the British Council ELTON Award (for Innovation in English Language Teaching). Flo-Joe also has supporting Facebook Pages for FCE, CAE and CPE, with a combined following of more than 114,000. I love this site! It’s wonderful! Ever since I discovered it, I enter diary on the page to see the the news! It helped me a lot with my English learning. Is it possible to become flo-joe holic? I have!!! First of all, I would really like to thank you for creating and sharing such a useful, complete and interesting exercise resource website. I have been teaching FCE as well as CAE levels for nearly one year and it sometimes becomes a bit difficult to get further practice exercises, or we sometimes run out of ideas about how to teach. I am pretty sure my colleagues will love taking a look at your work.